The Menat (Illustrations Nos. 50, 53, Plate IV) were specially dedicated to Hathor, who was a type of Isis, and was worn for conjugal happiness, as it gave power and strength to the organs of reproduction, promoting health and fruitfulness. It frequently formed a part of a necklace, and was elaborately ornamented; No. 50, from the British Museum, is a good specimen, the Cow being an emblem of the maternal qualities which were the attributes of the goddess, who stood for all that is good and true in Wife, Mother, and Daughter. The Two Plumes (Illustration No. 51, Plate IV) are Sun Amulets and the symbols of Ra and Thoth, the two feathers being typical of the two lives, spiritual and material. This was worn to promote Uprightness in dealing, Enlightenment, and Morality, being symbolical of the great gods of Light and Air. The Single Plume (Illustration No. 52, Plate IV) was an emblem of Maat, the female counterpart of Thoth, who wears on her head the feather characteristic of the phonetic value of her name; she was the personification of Integrity, Righteousness, and Truth. Illustrations Nos. 54, 55, 56, Plate IV, show three forms of The Nefer, a symbol of Good Luck, worn to attract Success, Happiness, Vitality, and Friends. The Cartouche, Or Name Amulet (Illustration No. 61, Plate IV), was worn to secure Favour, Recognition, and Remembrance, and to prevent the name of its wearer being blotted out in the next world. This is a very important Amulet, as the name was believed to be an integral part of the man, without which his soul could not come before God, so that it was most essential that the name should be preserved, in order, as described in the Book of the Dead, "thou shalt never perish, thou shalt never, never come to an end," the loss of the name meaning the total annihilation of the individual. 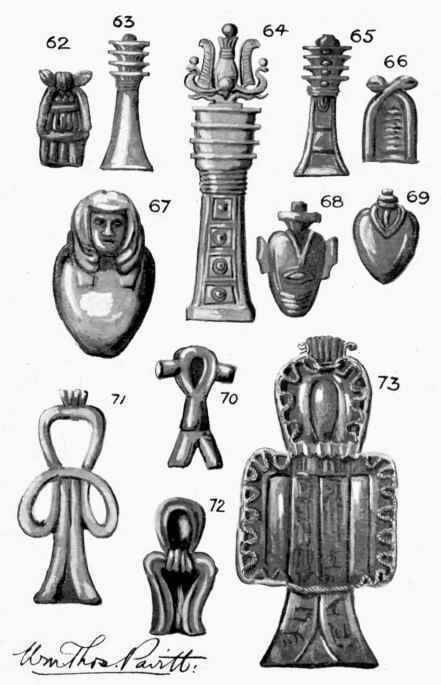 The Amulets Of The Angles (see Illustrations Nos. 58, 59, Plate IV) and The Plummet (No. 60 on the same Plate) were symbols of the god Thoth, and were worn for Moral Integrity, Wisdom, Knowledge, Order, and Truth. Thoth was the personification of Law and Order, being the god who worked out the Creation as decreed by the god Ra. He knew all the words of power and the secrets of all hearts, and may be regarded as the chief recording angel; he was also the inventor of all arts and sciences. Bes, shown in Illustration No. 57, Plate IV, was a very popular Talisman, being the god of Laughter, Merry-making, and Good Luck; by some authorities he is considered to be a foreign importation from pre-dynastic times, and he has been identified with Horus and regarded as the god who renewed youth. He was also the patron of beauty, the protector of children, and was undoubtedly the progenitor of the modern Bil-liken. Illustrations Nos. 62,66, Plate V, are examples of The Aper, which symbolised Providence and was worn for Steadfastness, Stability, and Alertness.